Members of the Controlled Molecule Imaging Group have resorted to a physical trick to persuade entire groups of molecules to perform synchronized cartwheels, virtually endlessly. This technique opens up new opportunities for imaging molecules and their chemical dynamics. 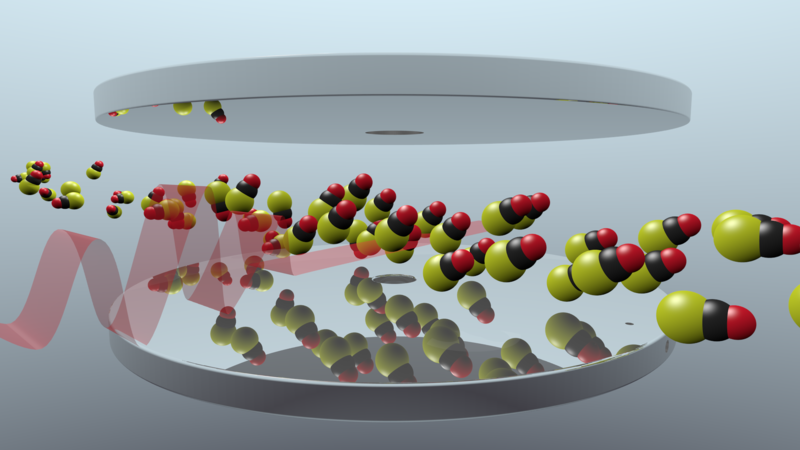 An near-infrared laser (red) makes the originally disordered molecules perform synchronized cartwheels so that all the molecules at a particular position along the beam are oriented in the same direction. (Picture: Jens S. Kienitz/CFEL, DESY and CUI). Scientists from the Center for Free-Electron Laser Science (CFEL) in Hamburg have resorted to a physical trick to persuade entire groups of molecules to perform synchronized cartwheels, virtually endlessly. This technique opens up new opportunities for imaging molecules and their chemical dynamics. Prof. Jochen Küpper and his team at CFEL are presenting their findings in the journal “Physical Review Letters”. Intense flashes of x-rays emitted by so-called free electron lasers offer detailed insights into the world of molecules. Researchers use them, for example, to explore the atomic structure of biomolecules and to better understand their function, or they try to film dynamic processes taking place in the nanocosm – such as the excitation cycle in photosynthesis. Until now, however, such molecules have generally had to be available in a crystalline form for such examinations to be carried out, because the individual molecules alone do not produce a strong enough signal. In a crystal, the molecules are arranged in regular patterns so that the signals from each add up, allowing an analysis on an atomic level. “Crystals represent a very special state, however – often imposed and unnatural”, explains Sebastian Trippel, the first author of the paper. 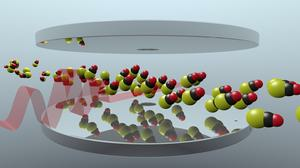 Scientists would therefore often prefer to examine free molecules directly. But how can such free molecules be moved, in a controlled fashion, into the x-ray beam of a free electron laser? Scientists have been experimenting with different methods of guiding the molecules, using electromagnetic fields and laser light, and aligning them in a particular direction at the same time. They have already succeeded in strongly orienting entire ensembles of molecules in the same direction for such examinations, “however when you do this, the molecular ballet is influenced by an electromagnetic field, which can in turn have an unwanted effect on the measurements,” explains Jochen Küpper, a scientist at DESY, who is also a member of the Hamburger Center for Ultrafast Imaging (CUI) and a professor at the University of Hamburg. The molecular tamers working with Küpper have now found a way of preserving the alignment of molecular ensembles even after the laser field has been switched off. For their test, the researchers used carbonyl sulfide (OCS) as a simple model system. The three atoms that make up this molecule (carbon, oxygen and sulfur) lie in a straight line, and this simple structure makes it particularly suitable for demonstrating the method. The scientists released high-pressure carbonyl sulfide molecules into a vacuum chamber through a fine nozzle, as a result of which the gas expanded and thereby cooled down rapidly. They then used a so-called deflector, a kind of prism for molecules, to fish out those molecules that were in the lowest-energy state. 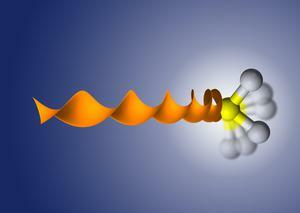 A tailored pulse of infrared laser light mixed this state with the first excited quantum state. As a result, the molecules started to perform, synchronously, a so-called inversion, whereby the individual molecules fell in step with each other, so that the sulphur atom (S) of the molecules all simultaneously pointed up or down. This inversion continued undiminished even after the molecules had passed the infrared laser and were moving through space without being affected by an alternating electromagnetic field. “In a sense, the laser forces the molecules to perform synchronous cartwheels, which would continue forever if they didn’t eventually reach the walls of the experimental apparatus”, Trippel explains. The molecules travel an almost infinite distance compared with the period of their inversion – they have enough time to perform hundreds of thousands of cycles of this motion before they collide with the wall of the vacuum chamber. For experimenters, this offers some very tangible advantages: all they have to do in order to select a specific orientation of the molecular ensemble under scrutiny – in which the two orientations alternate regularly – is to select the appropriate moment in time behind the laser beam. This method not only works for the two lowest energy states, but in principle for all states of a linear molecule, as the researchers point out in their paper. “This targeted molecular choreography opens up new possibilities for holding ensembles of free molecules in the x-ray beam of a free electron laser in a controlled fashion, so that they can be investigated there,” says Küpper. CFEL news "Molecules Perform Cartwheels"
CUI news "Molecules perform endless cartwheels"
DESY news "Molecules perform endless cartwheels"
DESY Photon Science news "Synchronised rotations for novel investigations"